June 25 through July 1, 2017! Simply give a copy of this Flyer to the cashier upon check out. Five Below will donate 10% of your sale to Sparkle Cat Rescue. Help the 'forgotten felines' we rescue by shopping from 9am to 9pm, 7 days! ​Right click image of flier above, save file and print from your computer. 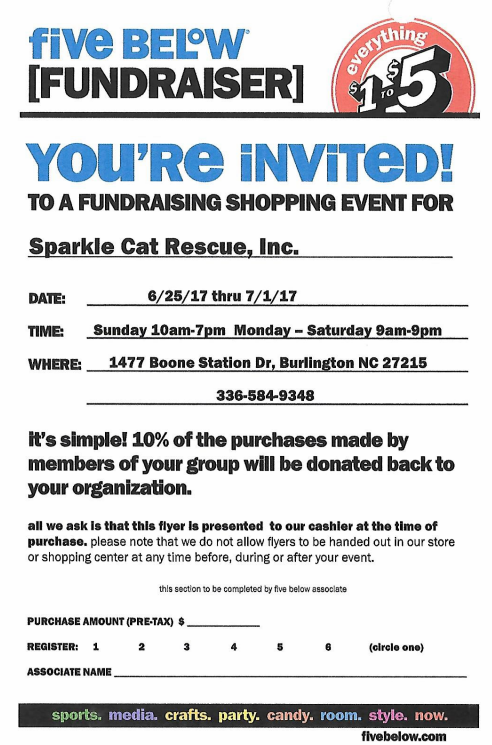 Print and take to Five Below in Burlington, NC for 10% of your purchase to be donated to Sparkle Cat Rescue during the week of June 25 - July 1, 2017. Thank you for your support! ​If you have any difficulty downloading file, please email us at sparklecatrescue@gmail.com and we will email you a flier.